When you need something to cover up the floor in a space in your home, a rug is a great way to go. Whether it's to keep the floor clean, safe from pets, or just for the aesthetic appeal, many people want a rug that will look decent and keep everything well protected. In these instances, many people turn to a Berber carpet for the great look and convenience available. To help you with finding the ideal carpet solution for your unique home and situation, we're going to provide information on some top choices on the market today. We have also included a buyers guide, FAQ's section and loads more valuable information for your convenience. So look no further and check out this comprehensive article about everything you always wanted to know about Berber carpets. Five Reasons Berber Carpet Tiles Are Awesome! What does Berber actually mean? What are the benefits of Berber? Is it good with pets? 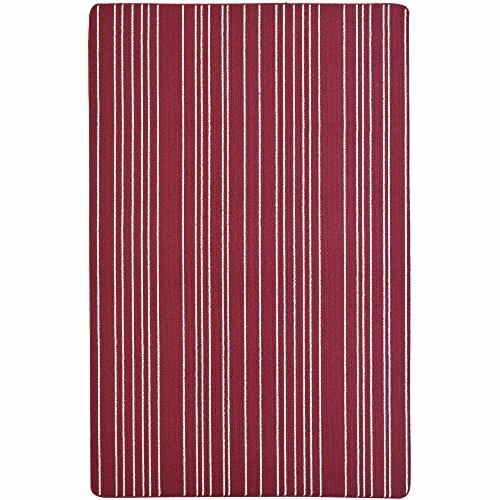 This is a simple, middle-of-the-road carpet that is easy to use for a number of situations. It's great for households with pets, hallways and just about any other situation where you want to protect the floor. You get to choose your size, and the color is simple and neutral. 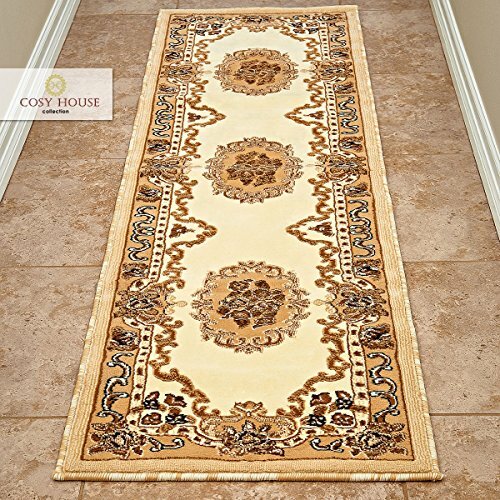 This is a simple runner that is great for a hallway. It's a muted gray/blue tone that isn't going to be an elaborate décor piece, but it will be great for muddy shoes, paws and the like. Because of that, this is going to be an option that is more about function than style. Furthermore, the backing is made to be non-skid so that it will stick to the floor and stay in place even in high-traffic situations. It's also going to be very resistant to stains, aided in part by the darker color. When it does need to be cleaned, it's easy to hose off and let dry. Many customers appreciate the heavy-duty design of this runner. It's a solid piece that you can use as a whole or easily cut into the size you need if you want smaller sections of carpet in more places. That benefit can be especially useful when you want to cover a smaller space that doesn't fit the shape of the runner as-is. It's also a great option for keeping dirty pet paws from leaving messes on your flooring. It gives pets and guests a place to stand while they get cleaned off or take off their shoes after coming in from outside. Some customers do find that the image pictured is more of a dark gray, whereas the actual coloring has a bit of a blue tone to it. Largely, this may not be a big deal, but it can make a difference if you were set on a specific coloring that goes with your décor. Other customers may find that the edges can curl up and cause problems, or that the runner itself may be difficult to clean out completely because it holds a lot of dust. This can really vary between different runners and households. This is a great option for those who want to bring a little color to the floor of their home. 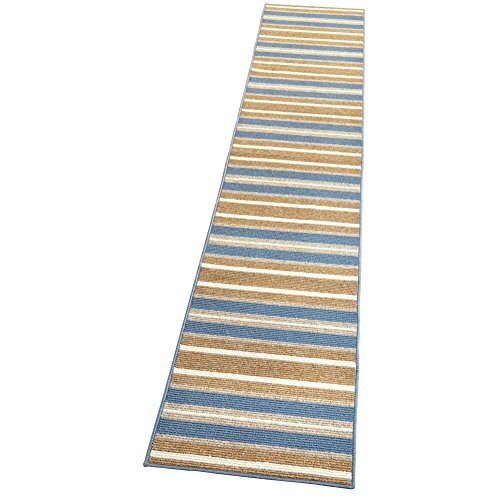 It's a relatively inexpensive runner that comes in a few different striped coloring options as well as different lengths so that you can get the right fit. 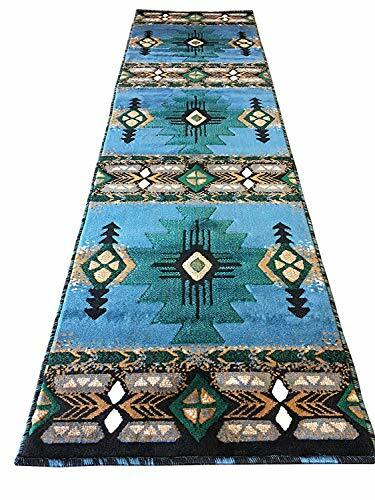 This runner comes in a number of sizes, with the longest reaching up to 10 feet, so you'll be able to get just the length you need. It's also available in black, brown and blue varieties to match up with your décor just the way you want. In addition, it includes a great slip-resistant backing that will help to hold the runner in place and keep it from sliding around under your feet. It's also relatively simple to hand-wash as needed. Most likely, this will only be in regard to stained spots that pop up through normal use. This is a great option for adding a pop of color to the floors as well as protecting the flooring underneath. It's a great option for dirty shoes or paws coming in from the outside. It's also a fantastic option to use on floors that may be on the slippery side otherwise. Unlike other options, this one offers a great look on top of functionality. Many customers also find that it is rather soft, making it friendlier to those who come in to contact with it. It's also available at a very affordable price, bringing you style and functionality without breaking the bank. While many have liked the runner overall, some customers have gotten the wrong color. This can be an issue with such a large item because it can become a hassle to send back to get a replacement. In some other cases, customers have found that it doesn't stay in place very well. There can also be instances in which the lighter-weight design can lead to the runner flopping over during use, causing wrinkles or other situations where users can trip. Because of this, some customers find that it may not be the best option for high traffic areas of the house. If you want something functional, with a SouthWest style then this is a great option. It comes in several unique colors as well as different shapes and lengths depending on what you need. It's also made to be highly durable and long-lasting. Whether you need a round rug to touch up a room or a long runner for a hallway, you'll surely be able to find the ideal option among these rugs. They also offer a great look that will bring a Native American touch to any room you decide to keep it in. These carpets use a jute backing to keep everything together and in place. They are also made to be easy to clean and maintain. Most likely, it will only need a spot clean on an as-needed basis on top of regular vacuuming. 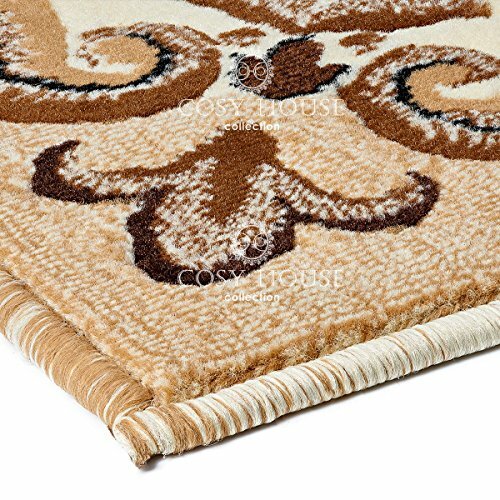 Each rug is made completely from olefin and is made to be a lasting piece. 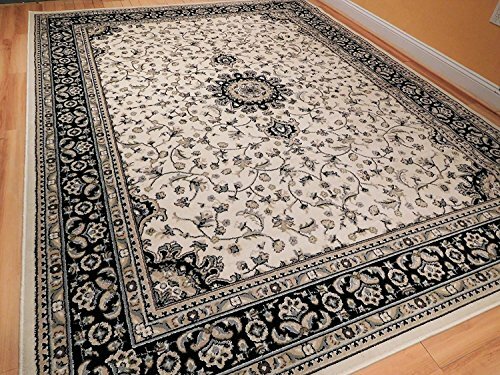 The most noticeable aspect of this rug is the design. It's a really great option of you're going for a specific aesthetic. Many customers also find it to be durable and well-made, so you'll be able to trust that it will last for a long time. The colors are bright, and the overall look is very pleasing. It also comes at an affordable price, so you won't need to worry about breaking the bank in order to add a touch of color to your home. It's really hard to go wrong with the gorgeous look of this runner. Some customers have found that this option may not stay in place as well as others, so you may want to look into a backing that can keep it from sliding around. Some other customers may also find that it's too thin for their tastes. Keep in mind that there can be some wrinkles that occur during the shipping process, so you may need to work to get them out. There are a number of ways you can do this, many of which are easily available online. There can also be some small differences in the actual color. If you're in the market for something with a unique design and a lot of style choices, this is the ideal option. It comes in many different colors so that you can find something that fits your décor, though it may be a little more expensive than other options. You can get this option in multiple sizes and it's thick and soft, showing the real quality offered in this product. While it is more expensive than other options, it backs it up with a gorgeous look and the ability to resist stains, so you won't need to worry as much about cleaning it. Furthermore, you also get a lifetime guarantee that can ensure you're satisfied for as long as you keep this rug around. It's also woven from olefin, which is known to be easy to maintain and clean, so you won't have to be concerned about any serious damage coming to it. Customers who have purchased this rug have found that they receive a lot of value for the cost, due to the high-quality build of this rug. Many also find that any stains that due make their way onto the rug are easy to lift with some simple cleaning supplies. The overall design is wonderful, and this option receives a lot of praise for staying flat on the ground. That way, there isn't much of a worry for wrinkles or flipping up that can result in people tripping. It also isn't going to break the bank. In some cases, customers have found that the size they order and the size they get don't match up. 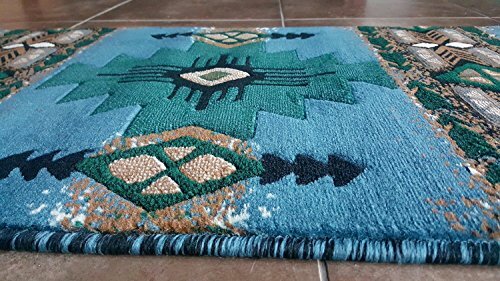 Typically, the received rug is smaller than the measurements ordered, which can be a problem if you want something that fits an area perfectly. Some other customers can notice issues with wrinkles that won't seem to leave the rug. This can be problematic, especially if it's placed in a high-traffic area. Because of that, you may need to find a way to flatten the rug before it can be used regularly. If you can place something heavy on it for a while, it may help. If you're looking for something with a more traditional look, these Persian style rugs have a lot to offer. They are available in a few different colors and sizes so that you can get what you need and the come at an affordable cost that is sure to work even for those on a budget. These rugs are a great choice when you want something that will brighten up your space. The vivid colors and designs are a fantastic addition to just about any household and will surely have all your visitors talking. Furthermore, this option is also made to be very durable and easy to maintain and clean. Any spots that show up on the rug will likely be able to lift out using just a mild detergent. Because of that, it's a safe choice for households with pets or children. Customers who try out this rug typically find that it stays in place very well and isn't prone to rolling up or wrinkling. This is great not only for the overall appearance but also to keep anyone walking on it from tripping over the bumps, allowing for a greater level of overall safety. It's also a great way to bring some color into a room that may otherwise be lacking. You'll have the option to choose something bright like a burgundy or blue, or something a little more mellowed like a brown or black. It all depends on your personal preferences. There can be some circumstances in which shipping might take longer than expected. This doesn't tend to be the norm, but it can happen depending on where you live. It's also going to be important to make sure that both the color and size match what you wanted. For the most part, customers tend to be quite pleased with this rug, but it can still be a good idea to make sure you're able to contact customer service with any questions or concerns just in case. It can also be a good idea to get a non-skid product to use underneath just for the most possible safety. For those who aren't familiar with shopping for rugs, there can be some variables that are important to keep in mind. On top of the overall cost, you'll also want to keep in mind the color or colors, size, and material that you want the rug to be made from. Largely, this option speaks for itself. If you have specific colors that go well with your décor, then you'll want something that works well with those colors. Otherwise, you may just want something muted that won't be an eyesore in your home. It's really going to depend on your personal preferences and how much you want the rug to stand out. This will depend on the space you want the carpet to fill. For many, a Berber carpet works great as a hallway piece. Getting something long and of high-quality in appearance can really add to your home as well as keep the floor safe. Otherwise, there are round options as well as those that work more as a doormat for those who come in from outside. The material can determine how long the rug lasts, how easy it is to clean, and how prone it is to stains. One great option for a rug is olefin as it doesn't tend to soak in stains as easily and can often be cleaned with just a mild detergent. Depending on how you want to be able to clean the rug, you'll want to really think about what it's made of. Luckily, there are a lot of options out there to help you find the perfect choice for you. Berber Carpet has long been a favorite with homeowners. The look blends so well with all design styles and the feel of Berber is unmatched by other types of carpeting. It’s no surprise that flooring suppliers now carry a dozen or more color patterns of Berber carpet, as consumers are always asking for more Berber carpet options! The overwhelming reason why Berber Carpet Tiles are awesome? They are easy! Everything about these carpet tiles, from the installation through maintenance and replacement is so easy; certainly more so than traditional rolled carpet. Easy to Install: Whether you choose interlocking, peel-and stick, or Berber Carpet Tiles that have to be adhered to the floor with a mastic solution, installing Berber Carpet Tiles is worlds easier than installing traditional rolled Berber Carpet. Looks Great: Just like the traditional rolls of Berber carpeting, Berber carpet tiles look and feel amazing. They are very low pile and the “loops” have a unique feel underfoot. The look of Berber blends well with all design styles. Easy to Remove: Much more so than with rolls of carpet and carpet pad, Berber carpet tiles are very easy to remove. You simply peel up the carpet tile using a floor scraper. If there is leftover adhesive on the floor, simply use an adhesive remover like this Krud Killer. 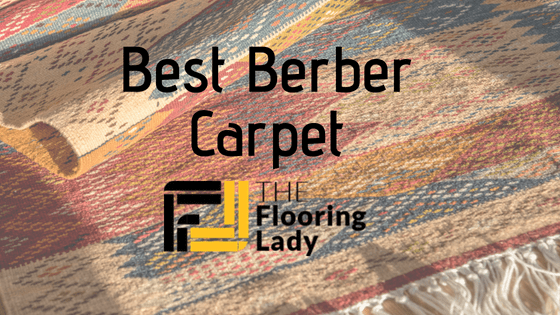 Easy to Replace: If a portion of your Berber Carpet is damaged or stained, you can pull up the individual tiles and replace them. This is by far my favorite quality of carpet tiles in general, but especially Berber carpet tiles. 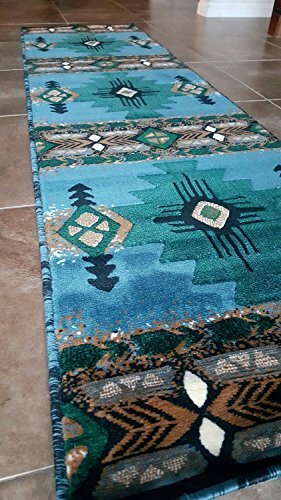 While the loops style of Berber carpet is what gives it the appeal, Berber carpet is known for having pulls and snags because of this. These can be fairly easy to repair (check out our article on Berber Carpet Repairs! ), but if you find a large section of your Berber is damaged or matted, you can just replace individual tiles instead of the entire room! Easy to Clean: Berber carpet tiles can be cleaned just like any other regular carpeting. Vacuum regularly, shampoo as needed, and always follow the manufacturers’ instructions. Where are you installing the carpet tiles. On what type of subfloor are you installing the carpet tiles. What type of use are you expecting to get out of your carpet tiles. Depending on each of the above, you may need to choose a different type of Berber carpet tile “style.” Most Berber Carpet Tiles come with a carpet pad already attached, but that is something I definitely recommend confirming before you purchase! The peel and stick variety is suitable for most of your in-home projects. A peel-and-stick Berber Carpet Tile will be exactly like what you imagine; a big carpet sticker square. You simply peel the backing off the tile and press it firmly to the flooring. The adhesives used here are suitable for use on even your wood floors, and most will be fairly easy to remove when needed. If you decide to peel up your Berber carpet tiles and want to use the flooring underneath, there are adhesive removing solutions you can use to get rid of any extra adhesive that was stuck underneath. I recommend these for almost all of your in-home projects. The Berber carpet tiles that require a mastic are going to be harder to get up, but also will stand up to more than average wear. 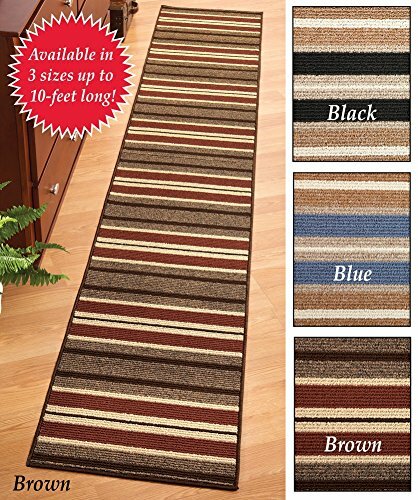 I would recommend these in a commercial application like an office or a business, where you don’t care about the flooring underneath, but you want that carpet to stay in place! These are a bit more difficult to install, but still absolutely do-able for the novice DIY-er. The best way for me to describe interlocking carpet tiles is to show you. Check out the video below about how to replace an interlocking carpet tile. These are the best choice if you are laying the carpet tiles in a basement or cannot use any adhesive on the subfloor for some reason. While they are going to be very strong, durable and easy to replace, you do need to keep in mind that these may feel less plush underfoot than the other varieties above. No matter what you are laying your carpet tiles on top of, make sure it is completely clear of dust and dirt and debris and completely dry before attempting an install. If any of the above is not the case, you’re going to have trouble with your carpet tiles sticking. This is where it becomes a bit controversial. Many will argue that you should always install carpet tiles from the center of the room and move outward. This is definitely true if you are installing any kind of a pattern with your carpet tiles. However, with Berber Carpet Tiles, you want the final effect to be of one large, single piece of carpet, not a pattern of any sort. For this reason, I find it is easiest to start along the longest wall in the room. Make sure to slide the tile underneath the baseboard so that it isn’t peeling up from the edge of the wall or leaving any kind of a gap. From this point, I strongly recommend laying out the remaining carpet tiles without actually installing. There are a few reasons this is a good decision. Most rooms are not perfectly square. If you assume they are, you may end up with a lot of crooked carpet tile pieces as you near the last 1/3 of the room install. You want to make sure they are lined up to match. Most carpet tiles have an arrow on the underside so that you can make sure they are facing the same direction. While the Berber Carpet may look like it’s all the same and not direction-specific, in actuality, if you were to just throw down a bunch of Berber tiles without getting the full visual first, you may notice some tiles seem to “stand out” from the rest, which ruins the effect. You want to be able to take in the full visual effect of the tiles. If you see something standing out that bothers you, it’s certainly much easier to change before they are actually adhered to the floor! Peel the backing, stick the tiles, and trim to fit. It should be fairly easy to trim the carpet tiles with a straight edge. You first need to learn a little about the different fibers that are available. Berber carpet comes in nylon, wool, Olefin, and polypropylene fibers. Each of these fibers comes with their own unique pros and cons. It is important to learn about each fiber so that when you go to the flooring store, you will be armed with the knowledge to get the right carpet for your home and lifestyle. Olefin and polypropylenefiber Berber carpeting will probably be your least expensive carpeting option. 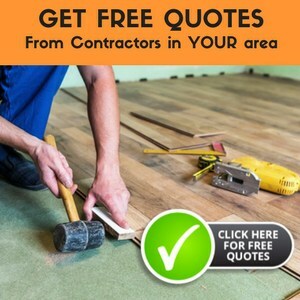 You should not, however, base your carpeting decision solely on the price or you could end up with carpeting that will need to be replaced much quicker than a higher quality carpet. The good points of these fibers are that they are colorfast and they are naturally stain resistant. The downsides are that they can be crushed easily by furniture, traffic, etc., and it is almost impossible to restore the loops after they are crushed. This carpeting is also susceptible to burning or melting when you move furniture over it, leaving a trail of where your furniture has been. If you want carpeting in an enclosed outdoor space or are looking for a transitional floor covering, then you would probably be happy with these two fibers of Berber carpeting. Wool Berber is classic and is luxurious. It may be difficult to find wool Berber, but if you want beautiful carpet that is long lasting and durable, then it will be well worth the extra time and effort. Wool Berber is naturally crushing- and stain-resistant, and is easy to maintain and keep clean. It is also naturally resistant to fire. 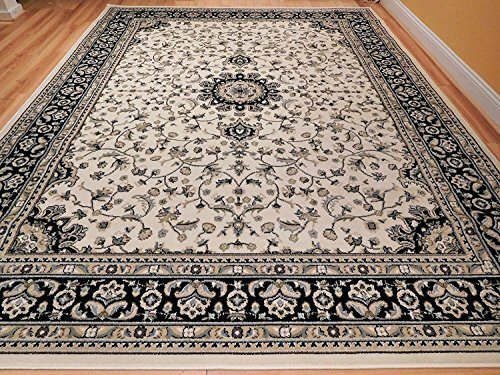 The soft feel of this carpeting and its durability make it a wonderful addition to any home.It’s miles soft and durable, giving your property a at ease experience and an expensive appearance. Wool is hypo-allergenic, so maybe an extraordinary desire for all of us who suffers from hypersensitive reactions. Due to the high charge of wool, this sort of Berber carpet isn’t always as popular as nylon and other blends. Wool Berber carpet, but, is hard and resilient, and consequently able to resist years of use. Nylon Berber carpet is strong, easy to dye, and easy to clean and maintain. These qualities are what has made nylon Berber one of the most popular Berber carpet choices today. This carpet is ideal for heavy traffic areas, such as a family room, and is crush resistant. With it will stain resistant, it will hold up well in homes with children and pets, too.Footprints are much less possible to expose up, and neither are vacuum tracks. The furniture is less possibly to imprint at the carpet because of the durability of the tightly woven fibers. Many house owners file decreased software and strength prices because Berber is thick and, therefore, act as a awesome insulator. You can pick out a thicker Berber carpet with small, tight loops or a Berber carpet with large, knob-like loops. It’s miles evan available with multi-stage loops for a fairer, more unique and distinct appearance.The best Berber carpet fiber is the one that meets the needs and function of your particular lifestyle. 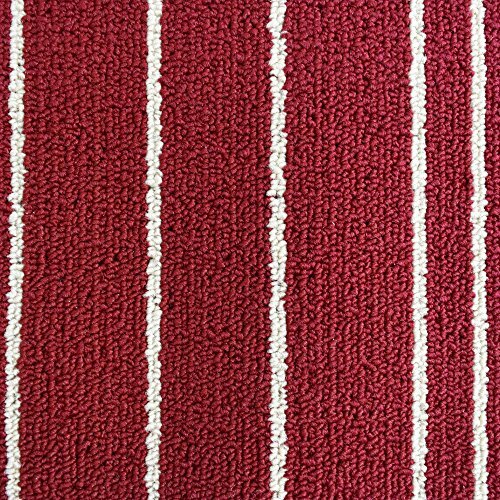 Quality is more important than price, especially if you have children or pets because a quality carpeting will be easier to clean and will hold up well to lots of traffic. Keep all of these factors in mind when going to the flooring store and you are sure to find the best fiber for Berber carpet that meets your needs and desires. Yes! Having a non-skid surface is very important. Rugs that don't have a slip-resistant backing or something underneath them that can stop them from moving can become dangerous in some situations. For the most part, people don't want something that is going to slip out from under them or move easily and cause them to lose their balance. Essentially, this refers to carpets that have both light and dark coloring. They are often a popular choice because they tend to provide more effectiveness at a lower cost than some other options. They can also sometimes do a better job of hiding dirt and dust that has started to build up within them. Many favor these as a low-cost option to add color and protection to their home. There are quite a few benefits to this type of rug. Many find them to be much more durable than other options, but do keep in mind that this won't be true for all quality levels. They can also often be made from materials that are easy to clean. Many only need spot cleans while others can simply be hosed off on an as needed basis. Everything has downsides, including Berber carpets. One of the biggest issues with these types of carpet are threads being pulled out, causing unsightly runs or snags. This can lead to problems with the overall look and functionality. In some cases, this type of rug may also not be as soft as longer options. This is largely due to the common low-pile design. For the most part, Berber is a fantastic option for households with pets. The only real problem that can occur is in households that have cats who enjoy scratching things up. There is a possibility they might find your new rug to be an interesting new toy, resulting in damage to the rug. This can sometimes cause the rug to unravel or simply gather loose ends more quickly. There are two rugs in this list that are tied for the top choice. 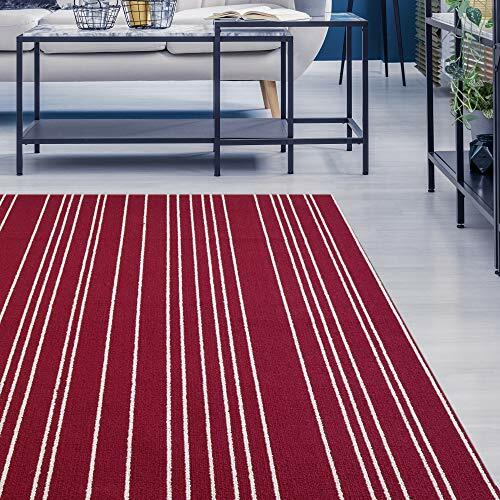 The first is the iCustomRug Berber Loop Carpet Runner, which is great for those who are seeking more functionality than a bright, stylish look. It's highly effective, easy to clean and non-slip so you won't need to worry about it moving around too much. 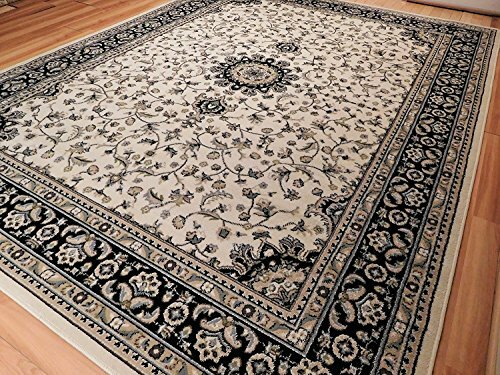 Second to that is the Large Traditional Persian Style Carpet which isn't an option that you'll be able to cut up or hose down, but it does offer a gorgeous look and is still able to be cleaned quite easily. Both of these options are truly excellent, but for slightly different purposes. If neither of these suit you, all of the others in this list come highly rated as well so feel free to take your pick, choose the color and size, and enjoy!